pictured here as a buckling...more pictures to come! We had Guinness shipped from California as a weaned buckling. He offers genetics that aren't common to our area or own does. Guinness is CAE/CL negative and passed his fertility testing with flying colors. I'm impressed with his ear length, breed character, and dairy qualities. He stands very correct and square. I think he will compliment our girls nicely and is just a classy guy with great personality and manners. We had the opportunity two years ago to purchase this very growthy masculine boy from the Williams from Cheney, Washington. He is beautiful and just as friendly. Aside from being extra stinky; our girls really like him! We are thrilled with his bloodlines and what he will offer our herd. Thank you Rich and Melaine! 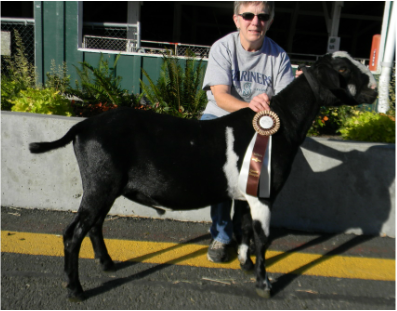 Cecil had an excellent show season this past year; winning Best in Show in two separate rings at the Wine Country Classic! Maverick was purchased from Sarah Drga at Golden Plains farm in Montana. He is a lovely boy with an outstanding pedigree. Below are pictures of his dam and Granddam's udders. He should throw some beautiful udders onto his daughters. "Smalls" was purchased from Eldon and Debbi Otta. They went to Wisconsin and hand picked this boy from Green Gables in person. I love this buck's masculinity, bone structure, and how smoothly he is made. 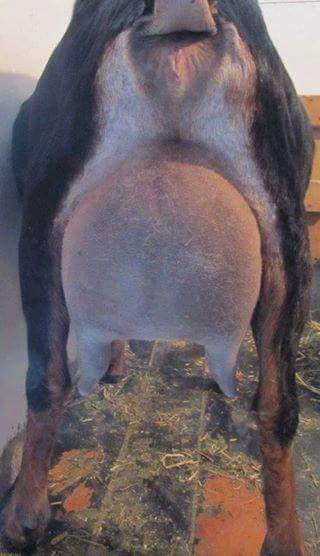 Above pictured is "Small's" dam's udder....courtesy of Laz E Acres. Jonah was brought from Kim Stokes and is proving to be a great addition to our herd. He is a very masculine buck that excels in width and power. As a buckling he shows stamina and covered his girls well even as a young buck. Leroy is a buck that caught my eye early in last year's kidding season. He comes from excellent milk/show lines from both of his standard parents....making a very desirable 50/50 cross. 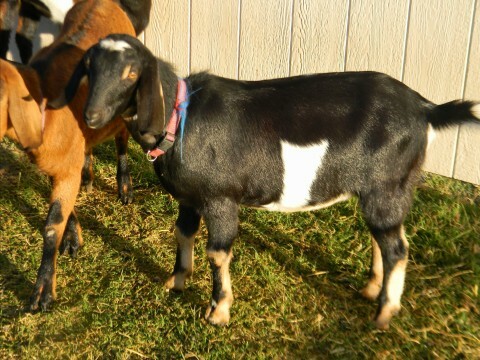 I plan on using him on my unrelated 1st generation does to improve my new line of mini Nubians. My goal is to improve the breed and offer new high quality lines to advance on. For only a 50/50 cross; Leroy shows promise in breed character, dairy abilities, and correctness of structure.